Although intelligence and wisdom may appear to be the same; there are observable, qualitative differences between the two. These differences are directly linked to the fact that our mind operates on either a lower and upper level. The lower level of the mind is highly rational and predominantly concerned with our immediate environment. Contrastingly, the upper level of the mind engages in higher order thinking by interlinking knowledge from mental, emotional and physical experiences. Lower level and higher-level thinking are linked to intelligence and wisdom respectively. In addition to this; being an intelligent person does not necessarily mean that you are a wise person. Intelligence holds the potential to manifest into wisdom over a long period of time. This substantiates why we tend to associate wisdom with the elderly. Intelligence refers to one’s potential to acquire and apply knowledge. Knowledge is the theoretical or practical understanding of a particular subject. Fundamentally, it is an abstract concept because the definition of intelligence is determined by social circumstances and the availability of scientific information. Therefore, it is important to acknowledge that intelligence is linked to one’s capabilities more so than what they already know. In terms of functioning in society, intelligent people are able to effortlessly pick up new skills, effectively solve problems and comprehend complex ideas. Often, one’s intelligence is tested through a variety of tests. On a societal level, our intelligence is tested throughout our lives and within various bureaucratic institutions such as school and college. It is also important to recognize that intelligence is not necessarily linked to the moral grounding of an individual. There are a number of scenarios where people have used their intelligence to break the law or hurt those around them. An intelligent person can effectively grasp both progressive and regressive bodies of knowledge. Wisdom is considerably more difficult to conceptualize than intelligence. There are a variety of unpredictable factors that contribute to an individual being considered wise. One cannot test wisdom by administering an IQ test or any other form of testing. 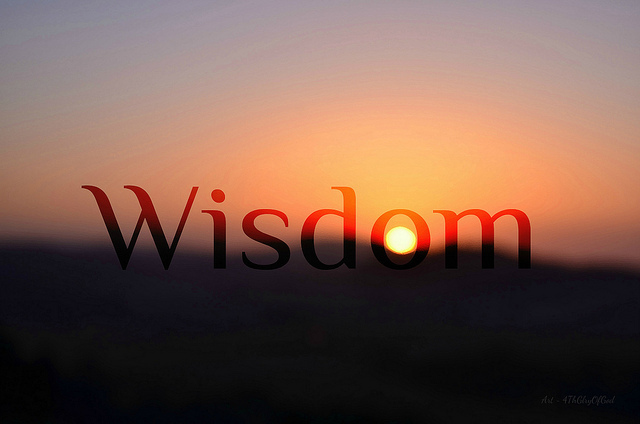 Wisdom encompasses obtaining knowledge through experience and critical judgment. Inevitably, everyone’s experiences are objectively and subjectively different. Thus, wisdom manifests in many different ways. Characteristically, wisdom is the ability to determine the truth and validity of accumulated knowledge. Moreover, it is usually developed by undergoing negative and positive experiences that develop one’s values and moral compass. Therefore, wisdom is the pairing of one’s accumulated knowledge and their ability to synthesize this knowledge using their moral understanding of the world. In relation to the previously mentioned ideas; wisdom has often been linked to spirituality and religion. There is no definitive link; however, wise people often adopt a ‘personal growth’ mentality – a characteristic of most spiritual and religious practices. Both Intelligence and wisdom are centered on the idea of accumulating utilizing knowledge. Furthermore, it’s usually impossible to be exclusively intelligent and exclusively wise. Most people or exhibit characteristics of both within different fields. In addition to this, both intelligence and wisdom are linked to the operation of the mind. The mind is a powerful and complex entity that holds the potential to shift and change depending on social and environmental factors. They are both independent concepts, yet they exist together. They both affect how an individual engages with their immediate physical environment. Intelligence and wisdom are two characteristics of the mind that inevitably cross paths. It’s unlikely for an intelligent individual to live their entire lifetime without gaining some kind of wisdom. This is especially true because wisdom is an undeniably subjective character trait. The most viable way to determine if someone is wise is to observe their behavior and judge their ability to acknowledge ethical considerations. However, these considerations are continually transforming. Thus, making it impossible to identify the true face of wisdom. It’s easier to conceptualize the difference between knowledge and wisdom when the concepts are applied to practical examples. Intelligence and wisdom are abstract concepts that are difficult to grasp without understanding their manifestation in the real world. People will often attribute characteristics of intelligence to successful figures like Bill Gates, the renowned co-founder of Microsoft. His understanding of his immediate environment inspired him to create a practical IT software that fosters the intellectual property and the potential of other intelligent people. Bill Gates can still be considered a wise individual. His intelligence was the catalyst of his success and his wisdom has allowed him to maintain his success for decades. On the other hand, wisdom is often displayed by progressive, successful political or religious leaders. These are the kind of leaders who relate to the world by understanding the variation of possibilities and opportunities that contribute to obtaining knowledge. A wise individual is often self-aware and a firm believer in striving for what is right. Many people would describe Nelson Mandela as an architype of wisdom. Wise people have a holistic understanding of their environment and often use their knowledge to enact long-lasting, meaningful change. Luale Joyce Monze. 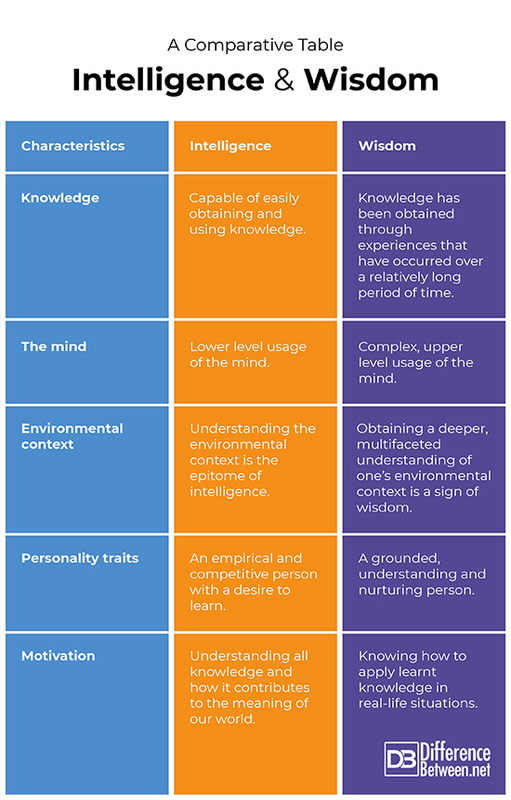 "Differences Between Intelligence and Wisdom." DifferenceBetween.net. November 12, 2018 < http://www.differencebetween.net/language/differences-between-intelligence-and-wisdom/ >. Intelligence is knowing a tomato is a fruit. Wisdom is not putting it in a fruit salad. "IQ Vs. Wisdom: What's The Difference?." HuffPost. 2014. Web. 25 Oct. 2018. Vajda, Peter. "Wisdom Vs Intelligence." Management-Issues.com. 2015. Web. 25 Oct. 2018.